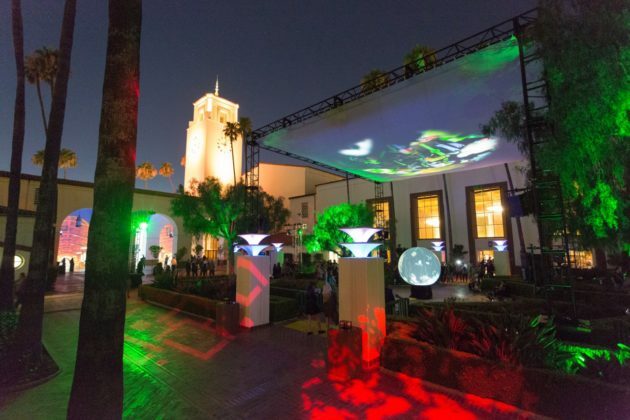 Pasadena, CA, USA – The Hettema Group (THG) recently completed a successful multisensory experience for Los Angeles Metropolitan Transportation Authority (LAMTA), transforming a portion of Los Angeles’ Union Station into an interactive media installation, Union Station 360°. The experience, which ran from July 15th – 24th, was the first in a series of free art events and concerts intended to revamp the 1939 transit hub into a public destination. THG was approached by LAMTA with the challenge of designing an immersive, media-driven event that would entice and attract local visitors to Union Station and increase awareness of this unique Los Angeles landmark. The experience THG created included two exciting, iconic installations. On the station’s south patio, a large, touch-sensitive, interactive projection sphere combined with a projection canopy overhead to celebrate Union Station and the entire transit system as a connecting force within one of the most sprawling and diverse cities in the world. THG also installed giant projection screens within the archways of the arcade leading to the patio. When guests stepped on interactive circles on the floor, the media on the screens reacted—changing from everyday shots of passengers circulating through the interior of Union Station to head-on shots of oncoming trains that appeared as if they would blast through the screens. Union Station 360° completed its final show on July 24, 2016 at midnight. The event was a huge success, attracting large crowds with its imaginative vignettes that explored the city’s rich past and vibrant present. The Hettema Group specializes in uniquely creative, impactful design and production in the world of experiential entertainment. THG, founded in 2002, is a full-service design firm, providing initial ‘blue sky’ concept ideation through on-site art direction and installation supervision. When conceptualizing any new guest experience, The Hettema Group begins the process with a series of brainstorming sessions, or charrettes. The brainstorming process for the media-heavy Union Station 360° project included a team of media producers, interactive directors, writers, graphic designers, creative directors, filmmakers and digital artists. THG developed a concept for the overall guest experience and, once the design was finalized, undertook the procurement of necessary equipment, media production, installation, commissioning and operation of the experience. In addition to Union Station 360°, iconic THG projects include the One World Observatory at the World Trade Center in New York, New York; The High Roller, the world’s largest observation wheel, in Las Vegas; Beyond All Boundaries, the award winning 4-D visitor experience at The National WWII Museum in New Orleans; and the USA Pavilion at the World Expo 2012 in South Korea. The THG team consists of experienced designers, architects, media producers, illustrators, master planners, engineers, technical designers and project managers, with decades of cumulative experience across a wide variety of disciplines. Under the guidance of Phil Hettema, THG works on a broad range of projects from theme parks and media-based attractions to large-scale parades and live events, museums and master planned destination resorts, including retail, dining and entertainment.